Can the Human Race Save Itself from Self-destruction? We all belong to the human race or human species: Homo sapiens. Black, brown, white or yellow, we are bound together as one on Planet Earth. Traveling at 67,000 mph or 18.6 mps around the Sun, our Spaceship Earth is a beautiful, tiny, fragile planet with a paper-thin atmosphere. The few privileged individuals who have seen Earth from outer space share an awareness of our home planet as a living, breathing organism. (See the video, Overview). We are all part of this organism. There is no separateness, only what we have created in our skewed conception of who we are and our place in the world. Growing inequality in the world’s richest, most powerful nation and across our planet is a signal of distress. If we want to survive, we have to start thinking and acting as one species. Our global human population has grown beyond levels that can be supported by our planet. Natural disasters, famine, and disease have not contained this growth. According to scientists monitoring our global footprint, our demand for renewable ecological resources and the services they provide is now equivalent to that of more than 1.5 Earths. In financial terms, we are spending more than we earn. Mother Earth is under stress. We are releasing more greenhouse gases into our atmosphere than the Earth’s forests and oceans can absorb, with devastating results for our oceans and climate. (See NASA’s key indicators of global climate change.) To make matters worse, our forests are shrinking, other vital species (like the honey bee) are dying out, and overfishing has caused the collapse of large-fish populations. These and other developments also affect our economies, our jobs, our livelihood, our neighborhoods, and our families. On the planet we call home, everything is interconnected and interdependent. We disregard this fact at our peril. Climatic changes are already underway and progress faster than previous projected rates. In numerous areas across our planet, grass root movements, such as 350.org, are working to bring about change. If we are to survive as a species, we all have to work together in changing the way we relate with each other and with our planet. We were all told from childhood that what we wanted was impossible. As we accumulate years, we also accumulate the sand of prejudice, fears, and guilt. Free yourself from that. Not tomorrow, not tonight, but now. For readers interested in learning more about the forces leading us to self-destruction and the way in which racism is used to prevent dissent, I recommend that you read the article, “Crisis of Humanity: Global Capitalism Breeds 21st Century Facism” by William I. Robinson, published today in Truthout. 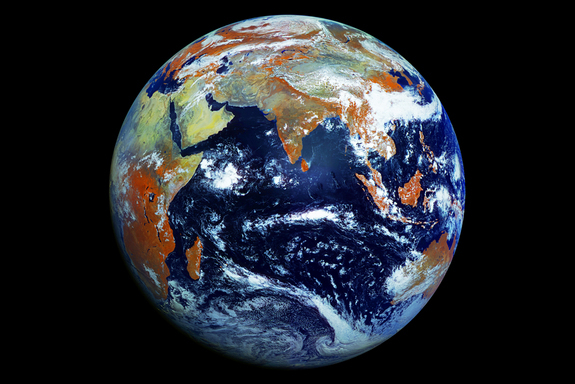 On Monday, 22 April 2013, over one billion people worldwide will take part in the 43rd anniversary of Earth Day. The theme this year is The Face of Climate Change. We are invited to take a photo and tell our story of the way in which climate change affects us and what we are doing to be part of the solution. 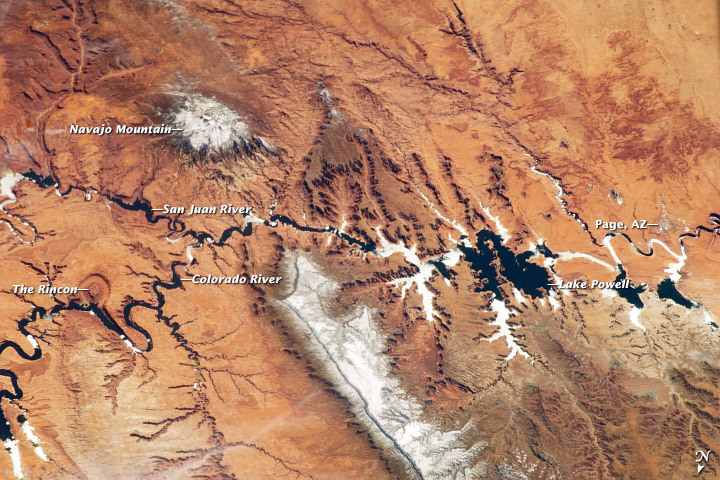 In my corner of Planet Earth, the Colorado River is the face of climate change. On 16 April 2013, the annual release of America’s Most Endangered Rivers ranked the Colorado River as our nation’s number one endangered river. This lifeline through the desert sustains over 40 million people in seven Western states: Arizona, California, Colorado, Nevada, New Mexico, Utah, and Wyoming. 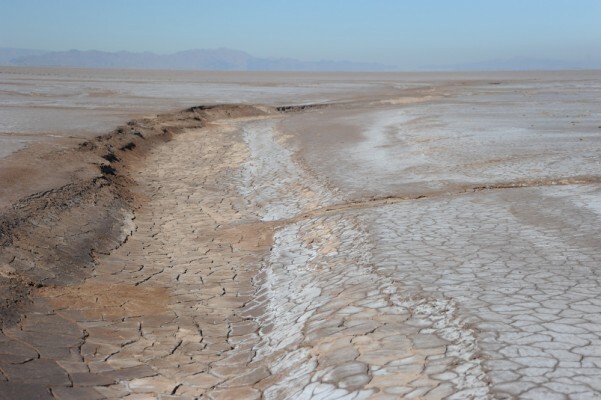 Our water demands are so great that this mighty river dribbles and dries up for some fifty miles before it reaches the Gulf of California. 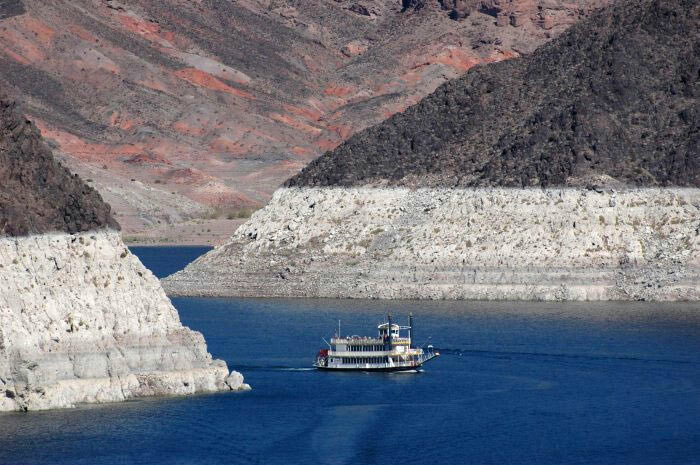 Lake Mead reservoir behind Hoover Dam shows signs of the worst ten-year drought in recorded history along the Colorado River. A white mineral “bathtub ring” along its rocky banks lies 100 feet up from the current water line to the 1983 high-water mark. American Rivers, the leading organization working to protect and restore our rivers and streams since 1973, warns that warmer weather and below average snowpack in the Rocky Mountains are expected to reduce Colorado River’s flow by 10 to 30 percent by 2050. Assuming a life expectancy of 80 years, my sons and all inhabitants of this region between 0 to 43 years old will face dwindling water supplies and subsequent effects on food production and industries. During the first three months of this year, California experienced its driest first-quarter on record since 1895. And we are not alone. Sixty-seven percent of contiguous states are drier than normal and the population in some places still struggle with exceptional drought. The weekly updated U.S. Drought Monitor Map shows the extent of drought across the United States. The U.S. National Oceanic and Atmospheric Administration reported in February 2013 that the 2012/2013 drought affected our nation’s agricultural production, river transport system, recreational enterprises, and municipal water supplies. America’s economic loss to drought is estimated at US$35 billion. With its dependence upon the waters of the endangered Colorado River, will Los Angeles still maintain its glory as the nation’s entertainment capital a hundred years from now? As an Angeleno, I am the face of climate change. I cannot claim innocence. I have to let go of my complacency. I have to change my ways and my habits. I have to conserve energy, gas, and water. I have to buy more locally grown food. I have to reduce my waste. I have to stop craving useless stuff that depletes Earth’s natural resources and heats up our atmosphere for its production. I have to walk and use public transport as often as possible to reduce my carbon footprint. I am the face of climate change. I cannot claim innocence. I am the cause and the solution. My goal to write and publish a weekly blog article continued to be a challenge in 2012. I extend special thanks to the publisher of the Guyanese Online Newsletter for re-posting my articles on his blog. Thanks, too, to you my ‘follower’ and visitor for taking the time to read my posts and for sharing your own thoughts. May you realize your goals and dreams in the year ahead. I failed to achieve my major goal of completing the revision of my first novel, Under the Tamarind Tree. Frustration badgered me for six months before I devised a workable system for cutting the excess length. In 2013, I aim to complete the revision process, have my manuscript edited by a professional, and find an agent. As if my frustrations as a writer were not enough, I also had to deal with contentious issues raised during the US presidential election campaign. Right-wing politicians sought to regulate women’s sexual and reproductive rights. Some of the stuff coming out of their mouths baffled and offended me. Have we failed as mothers in raising our male offspring? In a video leaked to the press, a presidential candidate dismissed 47 percent of Americans as dependent on government handouts who do not take personal responsibility for their lives. That hurt. Is there hope for changing the rules of an economic system that is controlled by and favors the rich? When Hurricane Sandy developed into a Frankenstorm intent on obliterating America’s northeastern states, it seemed as though the gods were warning us to get our act together as guardians of Planet Earth. While 97 percent of climatologists agree that mankind is causing global warming (ScienceBlogs, 20 Jan 2009), the major culprits refuse to change their ways and continue to foment doubt about global warming. How do we – the 47 or 99 percent – convince them to take responsibility in caring for our planet? Many of those who lost everything during the Frankenstorm will not recover from the blow and will join the 47 percent, already publicly derided as moochers who want stuff. Before we could recover from the devastation of Frankenstorm Sandy, a troubled young man kills his mother – with one of her own guns – and then goes on a killing spree at an elementary school, taking the lives of 20 children and 6 adults. Disturbing facts: the killer came from a wealthy, white, middle-class family of a well-to-do suburban neighborhood in the state with the highest per-capita income (US Census 2010). Can we curb our culture of violence and love of guns? We face these and more challenges in the year ahead. Our world did not end on 12.21.2012 as some believed or feared. The American Dream came to an end. Can a dysfunctional government that caters to the interests of the One Percent end the glaring inequality we face as a nation? Our ability to come together to overcome the crises we faced in 2012 gives me hope that we will prevail.